If your Monday was a bummer, Ben & Jerry's offers you a sweet Tuesday reprieve: Free Cone Day. Ben & Jerry's Scoop Shops across the world will offer free ice cream cones from noon to 8 p.m.
"The rules of #FreeConeDay are simple," the Vermont ice cream maker tweeted. "You show up, you get a free cone." The company said it's a way to thank its fans. "Our customers are incredibly loyal and share our values on important issues like marriage equality, climate change and racial justice," said company CEO Jostein Solheim. 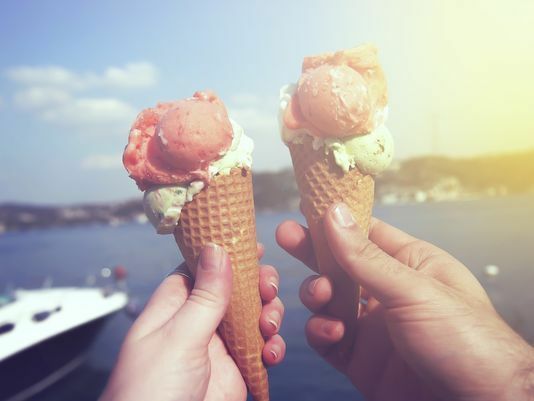 "Through the power of ice cream, we are able to form strong connections and create positive social change together. Free Cone Day is one way we show our fans how much we appreciate them." The tradition started on May 5, 1979 to show customers and staff appreciation for supporting the ice cream shop in its first year. At the time, Ben & Jerry's operated out of a renovated petrol station in Burlington, Vt. The tradition has continued. Today is the 38th annual Free Cone Day. Free ice cream comes with long lines. The company anticipates giving away more than a million scoops on Tuesday. The company suggests people pass the time in line by thinking of a new ice cream to try. Customers can get in line an unlimited number of times. The company introduced three new flavors this year: Urban Bourbon, Oat of this Swirled and Truffle Kerfuffle. Ben & Jerry's also is experimenting with ice creams that taste like the milk at the bottom of a cereal bowl. They're called Cereal Splashbacks and include Fruit Loot, Frozen Flakes and Cocoa Loco. LAS VEGAS (KSNV News3LV) — April 4 is "Free Cone Day" at Ben & Jerry's ice cream shops as the company celebrates another year of business. Since its first anniversary in 1979, Ben & Jerry's has hosted "free cone day" as a way of saying thanks to its customers. Today, customers at participating Ben & Jerry's shops can get a free ice cream cone from noon to 8:00 p.m. The company anticipates more than one million scoops will be given away today. 0 Response to "Tuesday is Free Cone Day at Ben & Jerry's"